Angkor Miracle is one of the newer luxury hotels in Siem Reap, but is fast gaining a reputation as being one of the most elegant hotels in its field with its fresh approach and glistening interior. The hotel is located approximately 3km from the center of town on Highway 6 heading out toward the airport. 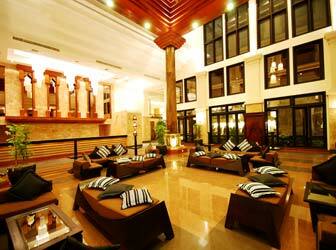 There is a total of 247 rooms and suites in the Angkor Miracle Hotel. The Miracle Suite is the best room in the hotel - spacious and with superb decor, it is elegantly designed with traditional Khmer and contemporary traditions in mind, but not sacrificing comfort giving you everything you need for a relaxing stay. Our usual rooms are the deluxe poolside rooms. The facilities of this hotel are numerous. There are several bars and restaurants, a coffee shop, spa and health club, gymnasium, souvenir shop, and even a tennis court. The highlight of Angkor Miracle for us is the limousine service. Your airport pick-up or tours of the city can all be done in the comfort of your very own chauffeur driven limousine. "We booked to stay at this hotel for six nights to fully explore Siem Reap and Angkor Wat plus surrounding temples. We enjoyed it so much that we extended our stay to twelve nights. We found it to be a little "Miracle" oasis just outside the busy, bustling and dusty city centre, but in easy reach by a relitively cheap Tuk Tuk ride. The room, service and food were all extremely good. The only downside to our stay was, with most other tourist only staying a couple of nights, it could be quite noisey in the mornings with some (inconsiderate) people going on sunrise tours to the temples i.e: slamming doors, movement of furniture and talking etc. But we would certainly return in the future." Lotus Blanc Resort, another fine hotel, with a lovely pool and garden.
" Challenges are what make life interesting; overcoming them is what makes life meaningful. "